Butter will give you a heart attack! Only cook with Crisco vegetable oil canola oil olive oil. Wait — everyone is switching back to saturated fats. Olive oil, grapeseed oil, avocado oil, — cold expeller pressed, extra virgin hand squeezed oil from pine nuts grown in a pristine Siberian forest? Am I the only one who is confused about which kind of fat is the best? It turns out, like most things, that the answer to the ‘best type of fat’ question depends on your genes. Most people carry genetic variants that are more optimized to using the plant-based polyunsaturated fatty acids, but some of us still carry what is thought to be the ancestral genotype that doesn’t utilize the plant-based oils as well. Fats are made up mainly of hydrogen and carbon molecules. They are categorized as saturated or unsaturated based on their carbon bonds. Saturated fats have their carbons bound to hydrogens, while unsaturated fats don’t have all of their carbon bonds filled with hydrogen, allowing for carbon-carbon bonds. Structurally, this makes saturated fats into a straight chain and allows them to be packed together as solids at room temperature (e.g. coconut oil). Unsaturated fats have a bend at their carbon-carbon bond, so they are less tightly packed together and liquids at room temperature (e.g. olive oil). Omega-6 fatty acids are named as such because they have a double carbon-carbon bond as the sixth bond, while omega-3 fatty acids have a double bond as the third bond. Omega-3 fatty acid can also be written as ω−3 or n−3. Same for omega-6. Common sources of omega-6 (as linoleic acid) in the diet include corn, sunflower, cottonseed, soybean, walnut, and peanut oils. Notice that these are all plant-based oils. Small amounts of omega-6 (as arachidonic acid) are found in chicken, eggs, and beef. Plant oils high in omega-3 include flaxseed and chia seed. The longer-chain omega-3 fatty acids, EPA and DHA, are found in fish oil. We often think of fats as being used for energy or stored as unsightly fat around the belly. But fatty acids do more than just those two things. Fatty acids, including both saturated fats and polyunsaturated fats, make up the membrane surrounding each cell in the body. Omega-6 and omega-3 fatty acids can also be used by the body to make eicosanoids (pro- and anti-inflammatory molecules), endocannabinoids, and cellular signaling molecules. My simplified overview of the genes involved in PUFA conversion. There isn’t just one “Omega-6” fat. The term applies to a series of different chains of fatty acids, defined by the length of the carbon-hydrogen chain. The omega-6 fatty acids that you eat in foods are generally linoleic or gamma-linoleic acid. These are changed in your body into arachidonic acid, eicosatetraenoic acid, and docosapentaenoic acid. This conversion takes place using enzymes called fatty acid desaturase (coded for by the FADS1 and FADS2 genes). For example, if you eat a plant-based oil high in omega-6 fats (sunflower, cottonseed, corn, etc), you are consuming it in the form of linoleic acid. 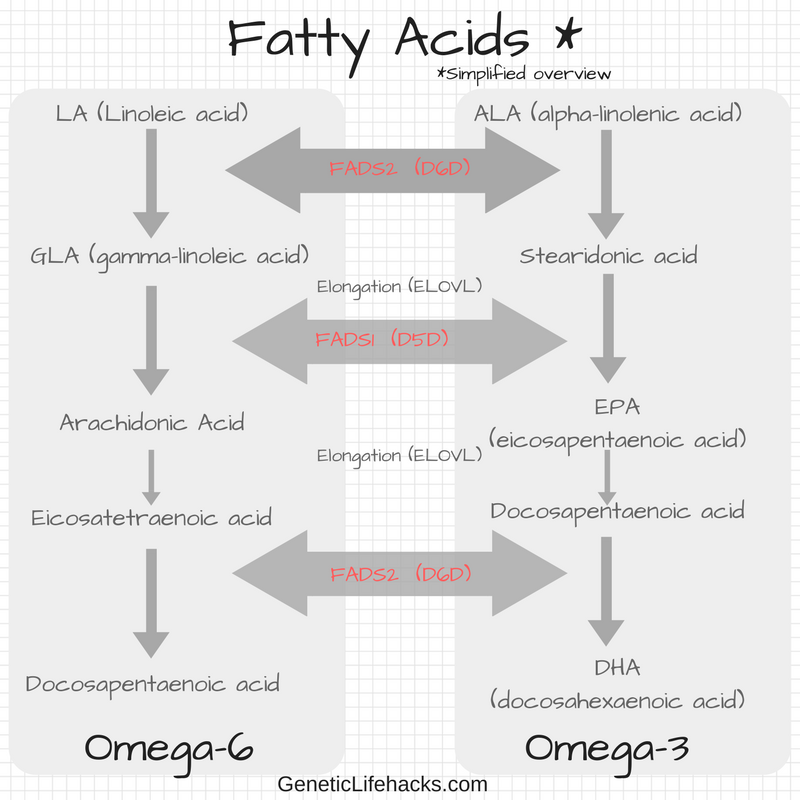 Linoleic acid can then be converted by FADS1 and FADS2 (in a couple of steps) to arachidonic acid. Similarly, omega-3 fatty acids are also transformed within your body. Most food sources of omega-3 from plants are in the form of alpha-linolenic acid. A small percentage of alpha-linolenic acid can be changed via the enzymes produced by FADS1 and FADS2 genes into eicosapentaenoic acid (EPA) and docosahexaenoic acid (DHA). To get EPA and DHA without converting alpha-linolenic acid, you must consume animal products such as fish oil. DHA and EPA are touted for their effects on lowering the risk of heart disease and for their brain health benefits. The same enzymes are involved in the metabolism of both the omega-6 and the omega-3 fatty acids. This is where the ratio of the fats in your diet comes into play. With only a limited amount of the desaturase enzymes available, a high ratio of omega-6 to omega-3 means that more of the omega-6 will be metabolized into arachidonic acid and less EPA and DHA will be produced. The FADS1 (codes for delta-5 desaturase) and FADS2 (codes for delta-6 desaturase) genes have several different variants which slow down the production of the enzymes. So what does a slowing of the production of these enzymes mean for your body? It depends on how much omega-6 and omega-3 you consume. If you eat a diet high in omega-6, having less of the linoleic acid (omega-6) turning into the sometimes inflammatory arachidonic acid due to having less of the enzyme can be good. But on the omega-3 side, this situation also produces less EPA and DHA if your diet is heavy on the omega-6 fatty acids. One way around this is to eat very little omega-6 fat; another way is to directly get EPA and DHA from fish or fish oil. Quite a few studies have found that those with variants that slow down the conversion of linoleic acid to arachidonic acid affect disease risks. A 2008 study found that those with higher arachidonic acid to linoleic acid ratios had a higher risk of coronary artery disease. [ref] The opposite has also been found in that those with variants slowing down the FADS enzymes can have a lower risk of heart disease. There are multiple FADS1 variants that decrease enzyme activity. These variants are linked together such that if you inherit one, you should inherit all the variants. Below, I’ve only included one variant, rs174546 (T is the risk alelle)– which is in linkage with rs174547 (C allele), 174537 (T allele), rs174550 (C allele) and rs174548 (G allele). [ref] I’ve included studies on all of these variants below. This is also linked to the above genotypes as well as rs174575 (G). The same enzymes are used for converting both the omega-6 and 3 to the longer chain forms needed in the body. The ratio between omega-6 and omega-3 intake is important for everyone, but it may be especially important for people carrying the FADS variant. In general, most people with the FADS1/2 variants probably need to shift their diets away from too much omega-6 and increase DHA/EPA (omega-3) from fish oil. Researchers believe that the FADS1/2 variants that are linked to lower enzyme activity were once the most common genotype. They theorize that the shift to the higher enzyme variants being most common was selected for when humans shifted from hunter/gatherer diets to agriculture based diets. This shift to higher enzyme activity then allowed humans to benefit more from the seed-based oils, so genetically the higher enzyme variants have been selected for to best fit the shift to agriculture around 8,500 years ago. Read the whole article here. An ancestral or paleo diet focuses more on fish, meat, and vegetables with little or no grains. This may be a great diet choice for anyone with two copies of the FADS1/2 low enzyme activity variants. It should shift the ratio of omega-6 to omega-3 fats to a good balance, and including fish will ensure enough DHA. Of course, the ‘best diet’ for any one person can’t be based on just one gene, but this gene is a good starting point when trying to optimize your diet. Let me make this simpler: if you carry the FADS variant, low omega-6 consumption = lower BMI. So cut out the fried foods, sunflower oil, and soybean oil. If you are a carrier of the FADS1 variant and relying on flaxseed and chia for omega-3’s, you may be converting very little of that to DHA and EPA.There are vegan options for DHA supplements available now. A Korean study found that a moderate fat diet (compared to high or low fat) decreased the risk of metabolic syndrome in people carrying the FADS1 variant. [ref] The study didn’t break down the composition of the diet, so it may be that moderating omega-6 consumption was the key. If you have read through all of this and realized that you need to increase your DHA/EPA levels, you may be tempted to reach for a fish oil supplement. Mercury and other contaminant are always a worry for fish oil (as well as when eating a lot of fish). A website called Labdoor does independent lab testing on supplements, including fish oil. If you register with them (free), you can see their in-depth report on different brands. Wow, I’m homozygous for every single minor allele in this article! My parents and sister recently became vegan, maybe not such a great idea for them? Thank you for all of this Debbie, I’m learning so much! I’m glad you are learning something from the Genetic Lifehacks website! When I found out that I was homozygous for the minor alleles, I tossed out the bottle of flaxseed oil that was in my fridge and then made a real effort to eat more fish. As far as your parents and sister go, without your parents both doing a DNA test, you can’t know if they are homozygous or just heterozygous (one copy of the variant). Either way, I would let them know that flaxseed and chia seeds are probably not working all that well for them for converting to EPA and DHA. I think there are some DHA supplements on the market that are made from algae that should be vegan. Turns out this vegan experiment is devolving (not surprised). My mom tells me that she and my dad are actually eating fish once or twice a week (I wish we were doing as much) and all 3 of them are taking fish oil. Apparently their version of vegan didn’t preclude a fish oil supplement. Yay! Am I correct in my interpretation that having a minor allele for the FADS1 variants is positive, leading to lower production AA? The only downside seems to be associated with the minor allele at rs174550 and potentially lower HDL levels. You’re quite right in thinking vegan short chain omega 3 supplements are available, they’re derived from algae! Thanks for your comment on this. As far as the minor allele being positive, I would say that it is positive in some ways :-) Again, like most variants, there are both pros and cons, which in this case may depend on diet. Too much arachidonic acid is linked to higher rates of cardiovascular disease, but arachidonic acid is essential for the body to have for a number of other processes. My main takeaway from this is that carriers (including me!) of the minor allele shouldn’t rely on flax or chia seeds for the DHA and EPA. Instead, they need to eat fish or supplement with krill oil or, as you point out, algal forms of DHA supplements.